Tough times, tough decisions. But also magnificent opportunities. That’s what a looming state budget deficit means for Gov. Jennifer Granholm and Michigan’s newly elected 92nd Legislature. Make no mistake about it: The soft economy and resulting decline in state revenues will dominate politics in Lansing this year as officials struggle to fulfill the state’s responsibilities and its constitutional mandate to balance income and expenses. How officials respond will be determined by whether they see our situation as a crisis to be survived, or an opportunity to be welcomed. State programs will be under the microscope, scrutinized in more detail than they have been in perhaps a decade. Priorities will be re-examined, and some programs may be eliminated. Others will be pared back. The state workforce will shrink. Certain government duties, once regarded as sacrosanct, will be found to be expendable after all. Adjustments of one degree or another will be undertaken within all 20 state departments. Ingenious and compassionate private citizens and organizations will surprise skeptics by expanding or arising to do what had recently been an activity of the state. As challenging as the situation may seem, we must keep it in perspective. First, state government is not the only means, nor necessarily the best means, for meeting human needs. Second, state government is not the only entity in Michigan that’s having a difficult time. Hundreds of thousands of Michigan families, nonprofits, and businesses are, too. Indeed, it’s precisely because those families and business are in trouble that the state is in trouble. We should never forget that the state has nothing to spend for anybody except what it first takes from somebody. And the state’s first priority ought to be the fiscal health of the hard-working people who, as taxpayers, have to pay the state’s bills before they pay their own. When they are not unduly burdened by taxes, they have less need for assistance themselves and more ability to help those who do need assistance. All across Michigan, citizens are coping with the challenges of an ailing economy. And they are coping by re-examining their spending. They are re-prioritizing, and doing without some things they’d love to have. They are hiring less, spending less, and taking fewer and shorter vacations closer to home. They are stretching further the dollars they have, and generally exerting the discipline necessary to weather the storm. Why should state government not do the same? In fact, why wouldn’t we welcome this as an opportunity for officials to demonstrate the discipline and prudence we expect from them? Another matter that should inform the budget debate in Lansing is the fact that Michigan families and businesses are shouldering a tax burden that is still above the average among the 50 states. What we get in exchange is a mixed bag. We get decent roads and good schools in some areas. But more often than not we get excessive construction costs, inefficient bureaucracies, and schools that parents and children are desperate to escape. Due in large measure to rising property tax rates and assessments, state and local taxes actually have risen since 1993, the year before Proposal A passed, from 10.7 percent of total personal income in Michigan to 10.8 percent in 2000, the most recent year for which numbers are available. The state’s Single Business Tax exacts a "take" that represents a larger portion of business income than that of perhaps any corporate income tax in the other 49 states. Even a May 2002 report from the Michigan Economic Development Corporation showed that Michigan ranks 16th among 17 peer states in business costs (meaning that 15 of the 17 states with whom we compete have lower costs). Michigan simply must make more progress in reducing the financial burdens it imposes on its workers, families and businesses. Because we live in a competitive and highly mobile world, we cannot afford to do otherwise. Gov. Granholm and the Legislature can pursue any number of courses as they navigate today’s troubled fiscal waters. On the one hand, they could ignore the difficulties faced by the state’s citizens and simply raise taxes. That would drive people and businesses elsewhere, and in the long run undermine the state’s financial health for many years. Until the early 1990s, that’s what Michigan often did, inspiring the all-too-familiar line that the last person to leave the state should turn the lights out. On the other hand, the governor and Legislature could follow the example of most of the state’s citizens who know what to do when times are tough: Make tough decisions. There is a magnificent opportunity in these difficult times to make a huge difference in how state government relates to its citizens — to regroup, stick to the basics and do them well, and trust the people. This is a time to strengthen civil society — that network of private institutions, community associations, schools and religious organizations, families and friends and coworkers, and all their voluntary, from-the-heart interactions. There is room for politics in our lives, but most of what enriches and defines us as a progressive and compassionate people emanates from other, deeper sources. As government grows, civil society shrinks. When government moves beyond its core functions, it does not create things out of thin air so much as it displaces what a free people would choose to do. And it ends up performing too many tasks too poorly, including the ones we absolutely must rely upon for the sake of safety and basic, essential services. If this is a radical notion, then America was founded on radical notions. For all people interested in the advancement and enrichment of our culture, this is a crucial observation with far-reaching implications. Cultural progress should not be defined as taking more and more of what other people have earned and spending it on "good" things through a government bureaucracy. Genuine cultural progress occurs when individuals solve problems without resorting to politicians, or the police and bureaucrats they employ. How can we restore and strengthen the attitudes and institutions that formed the foundation of American civil society? Certainly, we can never do so by blindly embracing government programs that crowd out private initiatives or by impugning the motives of those who raise legitimate questions about those government programs. We cannot restore civil society if we have no confidence in ourselves and believe that government has a monopoly on compassion. We’ll never get there if we tax away large portions of people’s earnings and then, like children who never learned their arithmetic, complain that people can’t afford to meet certain of their needs. We can advance civil society only when people get serious about replacing government programs with private initiative, when discussion gets beyond such infantile reasoning as, "If you want to cut government subsidies for Meals on Wheels, you must be in favor of starving the elderly." Civil society blossoms when we understand that "hiring" the expensive middleman of government is not the best way to "do good"; that it often breaks the connection between people in need and caring people who want to help. We make progress when the "government is the answer" cure is recognized for what it is: false charity, a cop-out, a simplistic non-answer that doesn’t get the job done well, even though it allows advocates to believe they’ve done the right thing.
. . . a wise and frugal government, which shall restrain men from injuring one another, shall leave them otherwise free to regulate their own pursuits of industry and improvement, and shall not take from the mouth of labor the bread it has earned. This is the sum of good government . . . Does the item weaken communities by assuming a responsibility best left to private families, charities or firms? Does the item force private businesses to unfairly compete with the state? Does the appropriation growth of an item exceed the rate of inflation or real personal income growth? The Mackinac Center for Public Policy recognizes that not all budget cuts are created equal. Some represent the proverbial "low-hanging fruit" — easy to reach, if not painless. Other budget cuts would surely entail at least short-term pain. We encourage readers to consider the potential for long-term gain — from all the cuts recommended herein, whether they be "low-hanging fruit" or, to mix metaphors, the "sacred cows" of the Lansing establishment. Michigan citizens have reason to be encouraged by the statements made by incoming Gov. Granholm and her representatives since the November 2002 election — statements to the effect that she will address the budget deficit from the spending side and avoid raising the tax burden on still-overburdened Michiganians. If she follows through and makes the tough decisions required in these tough times, she will truly display the kind of leadership she was elected for, and the Mackinac Center for Public Policy will be in the forefront of a cascade of praise that will be due her. Scrutinizing every nook and cranny of state government, raising questions about previously unquestioned premises, thinking creatively about how to do things better, if the state is to continue doing them at all — these are healthy, positive attributes of forward-looking leadership in a free society. While some may approach the state’s deficit with their minds already closed to the concept of downsizing the public sector, we ask readers of this document to think progressively. Why must the state do things as it always has? Why can’t — and why shouldn’t — private people and private institutions do more? Will they ever do more if we take for granted that they can’t or shouldn’t? With government at all levels consuming over 40 percent of national income — more than ever before in our nation’s history — why isn’t now a good time to make a big difference? 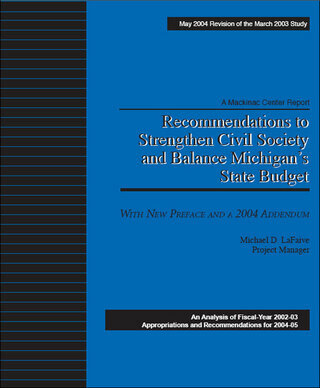 The following analysis examines the 2003 fiscal year state budget and makes recommendations for fiscal year 2004. If the legislature adopts the recommendations in this study it will be able to close the estimated $1.5 billion General Fund/General Purpose (GF/GP) budget deficit that is expected in fiscal year 2004, with millions to spare. Adopting every recommendation in this study would reduce overall state spending by $3.7 billion, which constitutes 14.2 percent of the total state budget. Of this total, $1,527,814,522 is from the GF/GP portion of the budget. We also recommend a 50 percent reduction in the state revenue sharing that is not constitutionally mandated, producing savings of $344,665,000, which should be redirected to the state’s GF/GP fund. In addition, we recommend the sale of three state properties worth an estimated $69,600,000, a fee hike worth $25,280,155, the elimination of the Life Science Corridor Initiative, which would save another $45,000,000; and use of the $11,500,000 in annual revenue from the state’s Indian Gaming Compact. Together, these savings and revenue enhancements exceed $2 billion. Most complaints leveled against the proposals in this study will fit into one of two categories. First, people will argue, "Why cut a program that constitutes such a small proportion of the total budget?" And second, people personally affected by the program cut, such as recipients of direct subsidies, will oppose the proposal on the basis that it will affect them disproportionately. Both of these arguments are easily refuted when examined more closely. In the first case, while it is quite true that eliminating one program will have little effect on the overall size of the budget, many of these cuts will certainly affect some people more than others, but this is not coincidental — it is these same people who are benefiting disproportionately by the very presence of the programs. What is unjust or unfair is not the elimination of the programs, but their creation in the first place. Over the past 12 years, the Engler administration took steps to reduce the size of state government. But there is far more work to be done. It is the Mackinac Center for Public Policy’s hope that Gov. Granholm will take much of Lansing’s power and return it to where it rightfully belongs: the homes of families and individuals who are the citizens of the Great Lakes State. One final word is of introduction is necessary. It is important to note that the title of this study is not, "Reducing the Proportion of State Spending Paid by State Taxes." A large portion of Michigan’s budget comes from the federal government. In this study we recommend cutting many expenditures funded entirely by Washington. The source of the funding is not the issue here. Restoring civil society requires reducing the role of coercive institutions (government) and increasing the role of formal and informal voluntary associations in improving peoples’ lives and solving problems. If a state function is outside the proper role of government, the fact that the money goes through Washington first is of secondary importance. "That’s federal money," is no excuse for continuing such functions. Each proposal within this analysis contains information described as the "appropriation breakdown." The numbers in these breakdowns refer to the origins of the funds used to pay for the program. There are four possible areas from which a program can be funded: Interdepartmental Grants, Federal Funds, General Fund/General Purpose (GF/GP) Funds, and Special Revenue Funds. Interdepartmental Grants are exactly what the name implies: funds transferred from one state department to another. For example, if the Department of Commerce were to assume some of the computer processing responsibilities of the Department of Labor, Labor would issue a grant to Commerce to help pay for the provision of that service. Federal Funds are funds sent from Washington to Lansing to subsidize the operations of various state programs. The source of Federal Funds is, of course, federal revenues, which are comprised of federal income tax, fuel tax, capital-gains tax, and tariff receipts, just to name a few sources. General Fund/General Purpose Funds are funds gained by the state from three main areas: state personal income taxes, state sales and use taxes, and single-business and insurance taxes. These taxes are broad-based and (in theory, if not always in practice) intended to fund programs that also have broad-based effects. Special Revenue Funds are comprised of many different types of state revenues. The most common type of Special Revenue Funds, however, is targeted taxes, user fees, and regulatory fees.